Machined from solid high grade Titanium billet. Machined true to the barrel, to avoid crossover. We guarantee our moderators will never gas cut, burn out or rot through! Titanium is at least 40% lighter than all steels and stainless steels! Titanium is stronger and ultimately more durable than all steels and stainless steel, yet similar in weight to aluminium! Titanium loses heat fast, and our moderators will not warp twist or kink, even on a full day at the range! Our Titanium moderators have been proven to last well over 15,000 rounds in a 2 year test period, and still look and work as new! We use our well proven strong and lightweight construction on our full range. This includes high quality threads and baffles which are cut from solid Titanium billet! 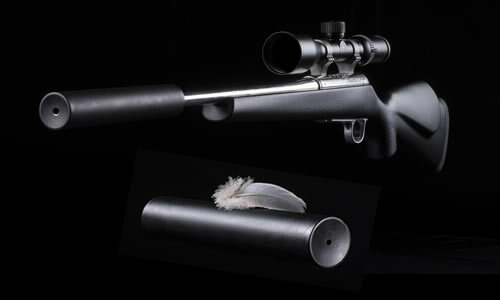 Due to our superior design and light weight, our Titanium moderators have proven time and time again to improve your rifles balance and performance ,whilst reducing noise, felt recoil and shooter fatigue, making your shooting experience even more pleasurable.